The final poster for this month's Deadpool 2 has been released online, featuring the entire main cast of the movie, including the X-Force, Cable, the X-Men, and a number of others, with Deadpool front and center riding a giant swan. The top of the poster features the hilarious tagline, "From The Studio That Killed Wolverine." The marketing for Deadpool 2 has been absolutely genius so far, getting Marvel fans even more excited for the hilarious anti-hero to return to the big screen next week. The latest poster for Deadpool 2 adds even more to this genius, with a bunch of little elements added to show how clever of a movie it should pan out to be. The most notable character inclusion is arguably that of Peter. Peter hilariously appeared at the end of the final Deadpool 2 trailer as a recruit for Deadpool's X-Force, played by Rob Delaney. Even though he had no powers or mutations whatsoever, Deadpool still hired him to be part of the team. Since then, Peter has appeared in a number of TV Spots, and has finally appeared on a poster. 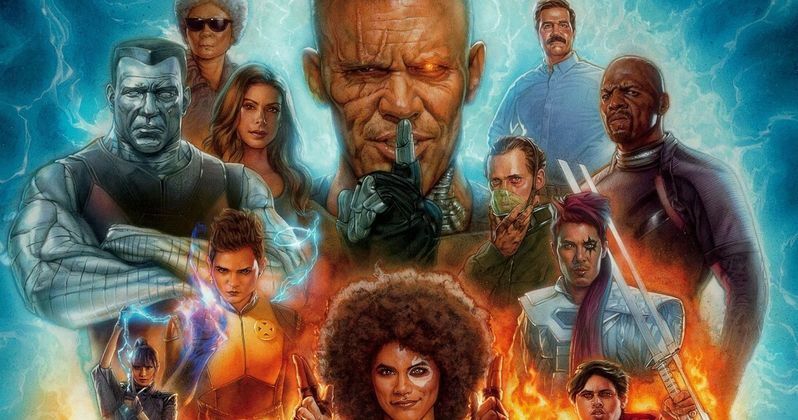 His inclusion is rather funny because, despite every other X-Force member on the poster dressing in a cool superhero outfit, Peter wears a bright blue, collared, button-up shirt, looking completely out of place. Peter has actually become one of Deadpool 2's best marketing strategies. The character has gained a lot of love from fans since appearing in the latest trailer, and even has his own official Twitter account where he shares details from his life as a beekeeper. Fans are anxious to see more of this hilarious member of the X-Force, making his appearance on the final poster a fitting inclusion. While the poster manages to show the action of the movie, featuring all of the characters in cool poses with fire underneath them, it also appropriately displays the nonsense we should expect to see from Deadpool himself. Deadpool is the only character in the poster not in a cool pose. Instead, he gently and seductively floats on a large, inflated white swan right in the center of the poster. Around him are floating rubber ducks that have caught fire as a response to the rest of the poster. The most hilarious part of the poster, however, has to be the kitchen sink at the bottom right. Many people know the common expression, "everything but the kitchen sink." Well, the final Deadpool 2 poster manages to include everything, including the kitchen sink. It's little jokes like this that promise us that Deadpool is indeed in the right hands, this type of comedy is essential to his character in the comics. Everything about this movie is panning out to be hilarious. Even the synopsis, despite being completely wrong, shows exactly what kind of humor we should expect from this movie. The latest and final poster for Deadpool 2 shared by Ryan Reynolds only gets us more excited for this highly-anticipated sequel. The marketing promises fun and depth to this hilarious franchise, making Marvel fans across the world count down the days until the movie releases. Deadpool 2 comes out in theaters May 18.